Visitors at Mostra Convegno Expocomfort 2018. 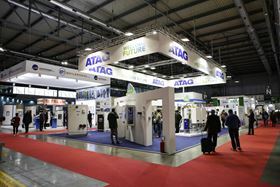 Organisers of the 42nd edition of Mostra Convegno Expocomfort (MCE), have announced that Turkey will be its partner country for MCE 2020, which will take place at Fiera Milano in Italy from 17 – 20 March 2020. MCE is a biennial exhibition for residential and industrial installations, HVAC and renewable energies and takes place alongside the Biomass Innovation Expo (BIE). The MCE’s Partner County initiative is aimed at strengthening business relationships with the fastest-growing economies around the world. According to the OECD, in 2017 Turkey had the highest GDP growth among OECD countries and is the fastest growing of all the G20 economies. Italy represents a key market for the Turkish HVAC-R industry, with Turkish exports to Italy in the heating systems sector reaching 38% of the market share. Turkey will be the guest of honour at MCE 2020 and the Partner Country initiative will run a series of promotional activities, developed in collaboration with the Turkish HVAC-R Exporters Association (ISIB), one of the country’s leading organisations representing over 900 companies in the HVAC-R sector. So far 70 Turkish companies have booked 3,600 m2 of conference space at MCE 2020.